Featured in “Legacy Magazine”, a publication of the National Association for Interpretation (NAI). Reflections on the state of interpretation in museums. 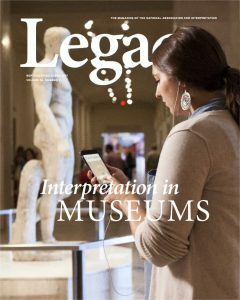 With interviews from industry leaders Ed Rodley, Douglas Hegley, and Jennifer Foley, I discusses the unfortunatly common practice of leaving exhibits intentionally void of interpretation, where interpretation has a foothold in the museum industry, and tips for interpreters who find themselves working with/for museums.